When I was a child I not only collected soap, I also loved and occasionally collected perfume. Do you remember Evening in Paris in the early 1960’s? Somehow, as slim as the monetary situation was, my mother occasionally purchased a tiny little blue bottle of Evening in Paris for me. Later in my childhood, I found myself combining perfumes, combining anything that smelled good (grass, flowers, etc…), even cooking essences. Fragrance, and the natural the better, was definitely close to my heart. Around 15 years ago, in the same small town where I purchased handcrafted soaps, I also had perfume made for myself, and cologne made for my sons (they always sent money with their mom). One day the gentleman that owned the perfume shop offered classes to me. At that time I lacked the go-get-it-done gusto that I have now. I couldn’t see through the haze. How could I take a week or two long class? How could I drum up $1,000? It was only $1,000! Ask me, have I regretted turning down the one-on-one class a few times? The answer is one big YES. 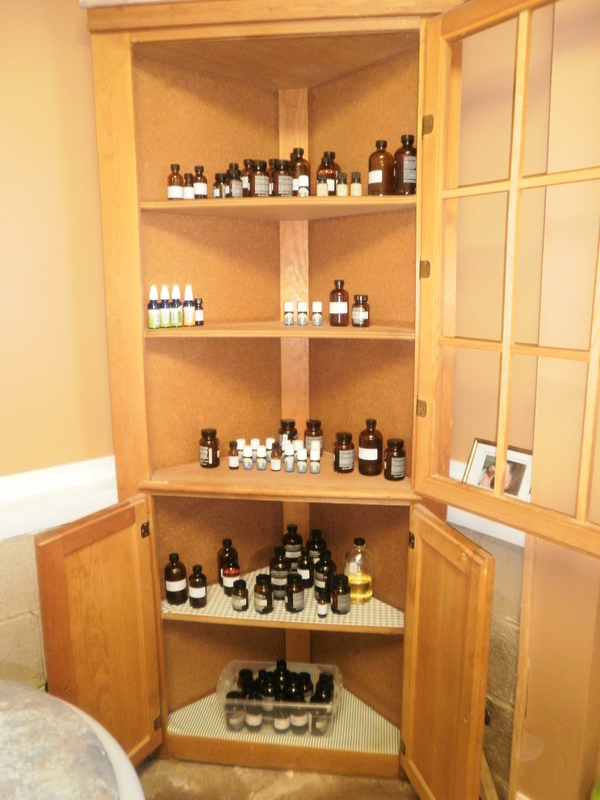 I studied and obtained a basic certification in aromatherapy at the Aroma Studio in New York a few years ago. I thought my appetite for fragrance, now geared towards natural, would be satisfied. It was not. The course was excellent. I refer to what I learned nearly daily. But I am not interested in practicing aromatherapy. My interest is fragrance. On the plus side, my nose was well-trained! So, this is what I am doing today. What you see in the photo are bottles of natural perfumes that have aged for at least 24-30 days. Why age? When natural essences are combined they continue to marry, they lose their sharp edges, they seem to warm to each other. Natural perfume is very personal. The wearer of a natural perfume is the one that benefits. The scent generally does not waft freely through the air beyond the person wearing it. Personally, the wearing of a natural perfume can change my entire day. It feels to me (in theory) like placing liquid sunshine on the skin…uplifting, grounding, beautiful, soothing…depending upon the oils used in the formula. One of my favorite blends contains tuberose and ylang ylang as the heart (middle notes). I swore I did not like florals…oh yes, I do. So, with the making of perfume comes many, many bottles of “duds.” I sniff the (duds) perfumes occasionally. As they age they normally smell a lot different than they did the day the oils were blended. Another drop or two of essential oil might give new life to the blend, if not, they make good room fresheners. Or, I wear them myself because I feel they continue to train my nose. 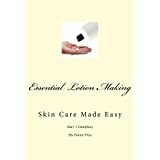 I plan to offer natural perfume in March 2012. Jojoba oil based, all natural, until I get my hands on organic grape alcohol. So…this post marks the launching of my natural perfume blogging. I am definitely green around the edges. I read a lot of perfume blogs and books. They are interesting. I need to learn an entirely new vocabulary! Better yet, I’ll just be different and talk about natural perfume my own way. It will be fun. Today I enjoyed my time in the soap shop. I always do savor my time there, but today I was inspired a bit more than normal. 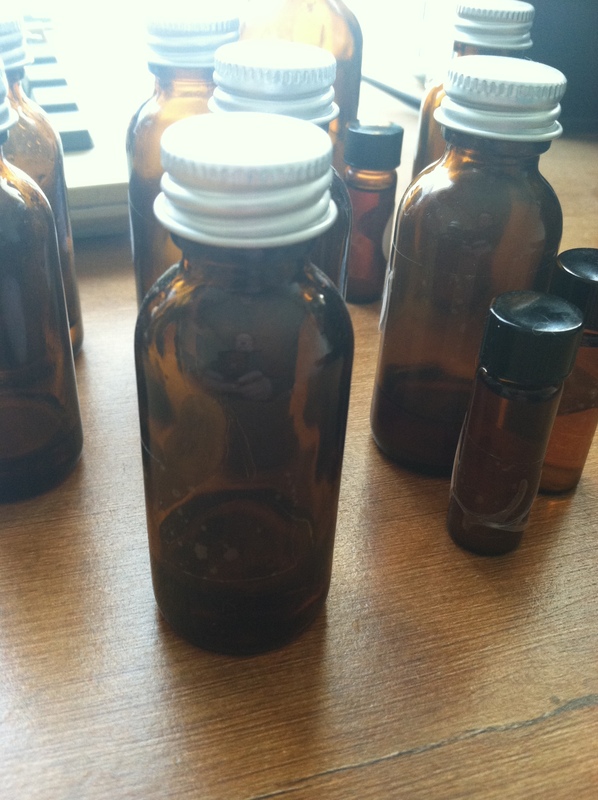 I have been studying natural perfume and soon will be ramping up the testing. Today I organized the essential oils that I have on hand. I organized by type (base, middle, and top note). I will be receiving several shipments of new oils this week and am excited to test new recipes. Of course, I want more oils. I will likely never be satisfied. As soon as I think I have the oils on hand that I will want/need I discover a new one that intrigues me. However, time, patience, and small (layered) steps are best. Aroma has been a part of me since I was a small child. Perhaps it began during the years we lived in France when I was a young child. I do not know. Soap was a passion that started at 7 years old. I am excited to bring the perfume forward for several reasons. First, I find so many perfumes on the market to be obtrusive to the senses. They are overwhelming. I believe perfume should be a personal thing. You and just perhaps a person close to you should be able to smell the aroma. I do not think perfume should permeate a room. Perfume should not cause horrible allergic reactions for those that are near you. That is why I am focusing only on natural perfumes. More to come on this topic soon. I am enthused, and hoping to share more with everyone soon. 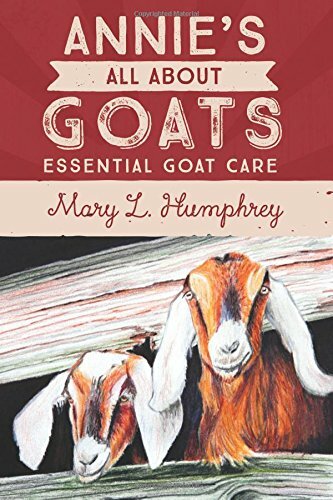 I have been temendously busy with the goats, the kidding season, and with helping my husband fire up his new business. Yes, the blessing has arrived after a long 2 1/2 years, he is working! And he is happy. In the meantime, I also completed a foundation level aromatherapy course. I learned a great deal about essential oils including safety, blending, and aromatherapy benefits. I have been studying and testing natural perfumes. It is hard work, believe me. I love the learning. Finding the time to study, and it will continue, is difficult. I will always read new materials, and another course is going to follow. I am going to apply what I have learned not only to my products, but also to my home, health and even to my animals. 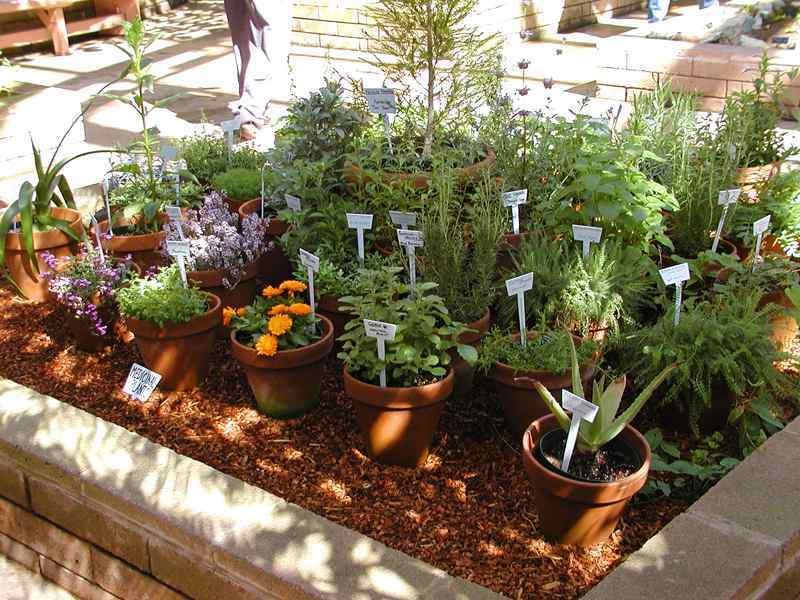 My small garden (for now) will be filled with additional herbs and flowers that I can use in products. I am hoping to receive my first certificate within 2 weeks, if I passed the exam and did well on the projects. I am excited, and I am very thankful! Have you ever taken on something new and find yourself seeing things in a different light? How about the rush of enthusiasm? Today I am covering a valued question from a customer. The soap that I normally purchase from Annie’s Goat Hill Handcrafted Soaps smells slightly different than the soap I purchased in the past. Did the recipe change? Essential oils are natural. An essential oil can differ for various reasons. Factors that play into variances in essential oils are: the plant crop, the manufacturer (and distillation method), the region/climate the plant is harvested in, and the harvest practices. Essential oils, like a good perfume, can age somewhat in the bottle. With good storage practices, essential oils can actually strengthen with time. The creation of a natural soap requires careful measuring and tracking. Each recipe is followed to a “t,” using an electronic scale that weighs the ingredients to the tenth of an ounce. Even with careful measurements there are additional factors that can affect the soap from batch to batch. 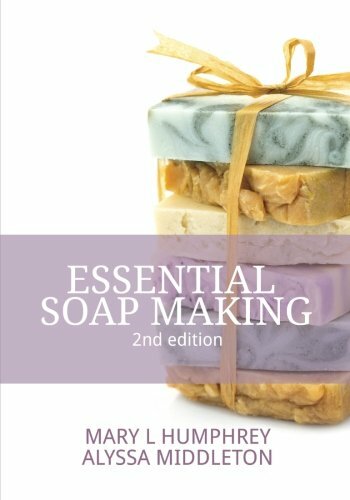 Season – humidity and temperature play a role in the soapmakers crafting practices. A difference in room temperature can greatly affect the first 12-24 hours of soap, changing the insulation needs, which could greatly affect the hardness and scent of the soap. Milk – varies from season to season. Have you heard the term “grass fed beef”? I can attest to grass fed milk. It is sweeter. Sweeter equates to more sugar in the soap recipe, which in turn affects the entire stability of a batch of soap. Age – of the actual soap bar itself. The curing process (4-6 weeks) not only allows the soap to become more mild, it also gives the soap time to harden (the moisture content in the soap drops drastically). I personally prefer an older bar of goat milk soap, especially one of my all natural soaps (some soaps contain man-made fragrances). 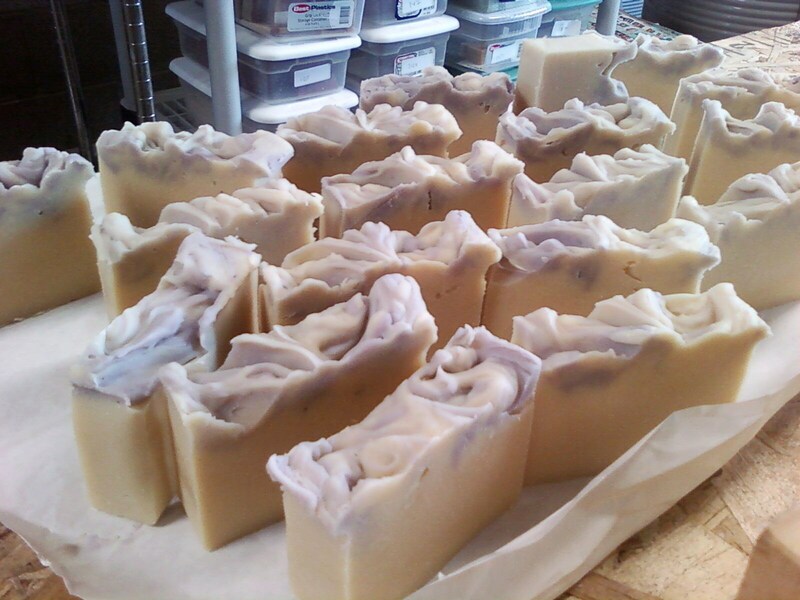 So…to wrap this up, with all of the careful intentions in place, natural soap can differ slightly from batch to batch! I love questions, please keep them coming! I recently did a study on scent. I thought I would learn additional fragrance blending methods, taking the skills to the shop with me. I picked up on more than that. Very interesting! How does a person detect scent? We breathe in tiny molecules that carry scent. The molecules travel through our nose, landing on receptors that are on a direct path to our brain (our olfactory system). No other sense is detected directly by the brain as is the sense of smell! We are constantly alert to scent, we live by it. We smell food cooking and we get hungry. We smell smoke and we instantly think danger! The nose is always at work. Scent is closely attached to memory. This experience can be good, and for some, a particular scent brings forward memories that they might particularly want to bury. From a very early age, our memories are glued to particular scents. This, in turn, directly affects our moods! Walk into a pristine drug store. Have you noticed the scent that wafts past your head as you enter the doors? It is piped in…piped in to make us feel comfortable, taken care of, creating a mood that makes us feel good about buying products from that particular store. But…scent isn’t just about what our nose smells, nor is it all about memory. It can also bring forward exact physical reactions within our bodies. Essential oils contain types of molecules that our bodies easily process. We breathe in the scent directly from an essential oil, picking up the molecules. The molecules travel to our lungs. A physical process transpires as our lungs begin to absorb what we have inhaled. As we absorb, the physical reaction that occurs is related to the properties of that particular essential oil. Take lavender, for example, calming and relaxing. A safe calm, without drugs. It makes a person think! It also brings forward a good reminder, when working with pure essential oils, know your allergies and special medical conditions. And lastly, speaking of scent, how does an animal detect our thoughts (such as fear)? They can smell it! Yes, they can. Our noses, as humans, cannot detect subtle hormonal or adrenalyn changes that are released (the odor of our body changes) when we become frightened or excited, but an animal can detect the tiniest of change. When we say animals have a sixth sense, literally, could it be that they simply have a keener sense of smell? It is definitely something to consider!